Goodreads: Jonathan Sweetwater has been blessed with money, a fulfilling career, great kids and Claire, his smart, gorgeous, sophisticated wife. But there is one thing Jonathan never had: a relationship with his father. Kritters Thoughts: Jonathan Sweetwater is a successful businessman and has what seems like the perfect life - pretty wife, two kids and the good job. Until one day. This day sends him on a journey to figure out his dad and where he really came from. Having a dad who is both famous and has had quite a few wives must be interesting, especially for a male. I enjoyed that he went on this journey to start at the beginning and go through the wives (even some that he had never met) to find out more about this father that has deceased. His father left when he was nine and hasn't been in his life since so this is definitely a journey to find out the man that his father became after he left his mother. I loved that each visit with each wife was brief but very impactful and that he learned about both the wives and the man his father was with each of them. I am a fan of Mike Greenberg and the way he writes characters. Their journeys and things they need to find to better themselves are just good. The last novel was from a woman's point of view and was fantastic - but I loved hearing him write a man's voice. 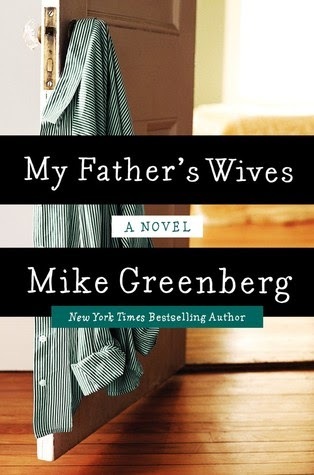 This is my second Mike Greenberg and I am officially a fan and will read anything he writes! I've been reading a lot of good things about this one. I was on the fence for a while, but I just added it to my TBR. Elizabeth - You should also check out his previous book - so good! !